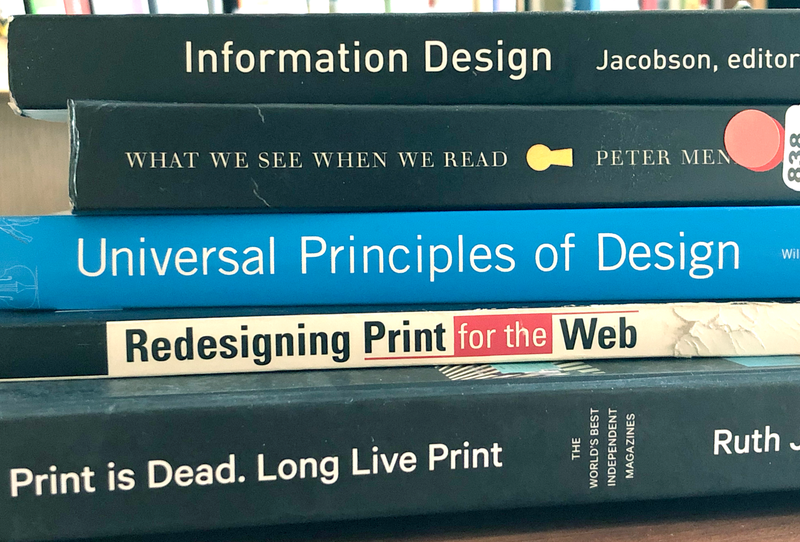 Some of the design-related books I have been browsing recently. One data point is an anecdote, two is a coincidence, three is a trend. That CJR piece is from 2016, but the point stands. Print is BACK! At least as a conceptual model to understand how and why people consume and understand the news. No one is — or should be — planning for the resurgence of print newspapers. But we can still mourn the loss of a certain quality of design, packaging and curation that print does exceedingly well. Ryan O’Connor (the director of UX at culturetrip.com, and formerly at the BBC, and HuffPost according to his bio) got to the point — the yearning for a ‘better news experience’ is about the reading experience not the physical ink-on-paper delivery of the news. Many print-focused readers of the paper wanted to see the stories in print clearly represented on the digital site. A typical use case was a reader would hear about a story or see it in the print paper but then struggle to find it online. This caused some distress — especially from readers who felt that ‘important news’ ought not to be cycled off the homepage of the website so quickly. To try and solve for this, the team built a ‘Today’s Paper’ section which simply represents the stories from that specific day’s print edition. That section is still available https://www.bostonglobe.com/todayspaper/ but I have no recent insight as to its popularity. Many people who were perfectly happy with digital tech still really preferred reading the replica edition. This is still a bit perplexing, but it does relate to #1, above. This is why, as Joeseph Lichterman of Lenfest noted on Twitter, I have started a research project with Dr. Shuhua Zhou here at Mizzou to try and understand the dynamic. The basics of the research (which started in March) are covered in the Medium post in the above tweet. But the concept is fairly simple — print newspaper design carries intrinsic value for news consumers. It includes affordances that communicate a number of complex signals — recency, category, urgency and geographic proximity among others. These signals are used by readers to understand the news. In digital we have largely failed to take these needs into account. We plan to spend the next few months talking to readers — both print-centric and digital-native to understand what elements in print and digital design they use to make sense of the news. In the fall or spring, we will move onto creating experimental designs in print and digital formats. But this exercise is not about ‘saving’ or ‘returning’ to print. It is about taking advantage of the 300 years of information design that was the evolution of the print newspaper — and adapting what works in the service of digital news. My line is always open if you have thoughts: kiesowd@missouri.edu.